Offering hope: Marie Mondu at the Caritas Australia Project Compassion campaign launch in Brisbane. Papua New Guinean local Marie Mondu was born in Bundi, PNG in 1977. She has worked with Caritas Australia’s program support team in PNG since 2008, starting as a research officer while at university. 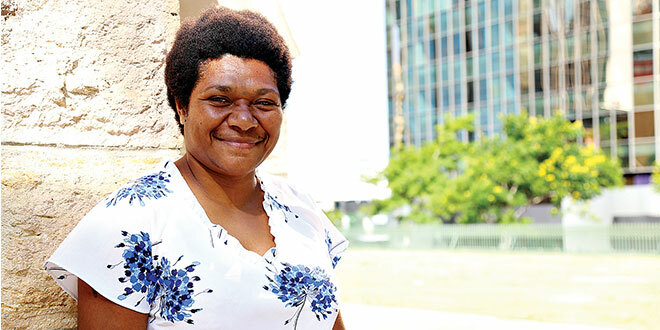 Born into a life of poverty, Marie has an interest in research areas including the socio-cultural influences of HIV and other sexually transmitted diseases in PNG, as well as cultural lifestyles that contribute to poverty. She now coordinates programs funded by Caritas Australia’s Project Compassion campaign. Q. How did you get involved in Caritas Australia? A: I think poverty touched me personally. I come from a very poor family and it was hard growing up and I felt when I had an opportunity. I learned it up in the right place. I started working for a Catholic University and when an offer came to do some research work for Caritas I took it. And as I was learning more and more about what Caritas Australia is and what it’s doing to reduce poverty I became inspired. So this will be my ninth year working with Caritas Australia. I’m one of the longest serving staff in PNG. The bottom line is this – I want to make a change in my community by using my talent and expertise to work with an organisation like Caritas Australia who can enable me to work better and try to reduce some of those things that I personally faced when I was growing up. Q. What exactly is your lifestyle now? A: I have a small family. We are Catholics. My son is five and my daughter is two. And we’re working out from Port Moresby. But our home province is not in Moresby, we have to catch a plane home and it’s hard to afford that. I had to transfer to Moresby. This is exactly what happens. Young educated people flick to the city for employment and we have to go back home and secure land and build our houses. We have to try and find some space and time to bring our children back home and understand the life there. When we retire we have to make a decision about where we stay in town or go back home and be of service to our communities. Q. What are some of the fundamental issues in PNG that rely on Project Compassion support? A: It’s hard to work in PNG. A lot of young people who have gone as far as university graduates are always looking for greener pastures. We not only work for ourselves. Not everyone in PNG is literate. In a way we do a lot of internal Project Compassion in our country. When I’m working, I not only work for myself but I need to feed my family and I also have to send money to my brothers and sisters who are not employed or who like 85 per cent of the population are subsistent farmers. They don’t have a paid job. They are not doing large scale farming, just backyard farming like vegetable gardens to sustain their families. If they have extra they can sell and get money for soap and kerosene for lamps and things like that. We’re everyday challenged by financial insecurity, food insecurity, access to health, gender inequality. Everyday we have to deal with this in PNG. And so my involvement, I think, when I’m working for Caritas Australia I’m exposed to understanding all those different issues more at an international level. And in my research experience I am able to focus on emerging lifestyle that is contributing to increasing poverty in our country. I’m inspired because I am also living in poverty. Q. What are the changes youíve seen in PNG since you started working for Caritas Australia? A: I think first of all we’re getting a lot of our stories out. Although good work has been happening in PNG for a long time, our story about PC is not reflected in the Caritas Australia annual report. Caritas does wonderful work everywhere around the world and it’s impossible to pack a report on every country around the world but we are Australia’s nearest neighbour and our relationship with the government of Australia, our history goes back a long way and it’s not fair on the part of the Australian community and supporters who know very little about PNG because they’ve been supporting it for a very long time through the government relationship, international relations and even through Caritas and other Australian based NGOs. The change is we are more visible in our programs. Q. How has working with and for the poor changed your heart? A: Personally I think it’s helped me to be appreciative and open. When you are too blind to all these issues, you’re not ready to open a hand to help. People in a developed Western country like Australia or even in parts of PNG, if you’re not exposed to this kind of information, and a day to day experience of what other people are struggling, you eventually become ignorant and not caring at all. It’s hard to speak about mercy when you can’t feel it in your heart. You’ve got to walk the shoes that most people walk through, hardship, dig deeper and do a bit more research and find out what exactly are they missing and I am taking for granted. Only then you can start to have this sense of empathy and duty towards justice. I have to do some serious change about my lifestyle and put my focus into helping others rather than thinking about how I should consume all these things for myself.